Denison Total Abstinence Union Denison July 11th 1878. 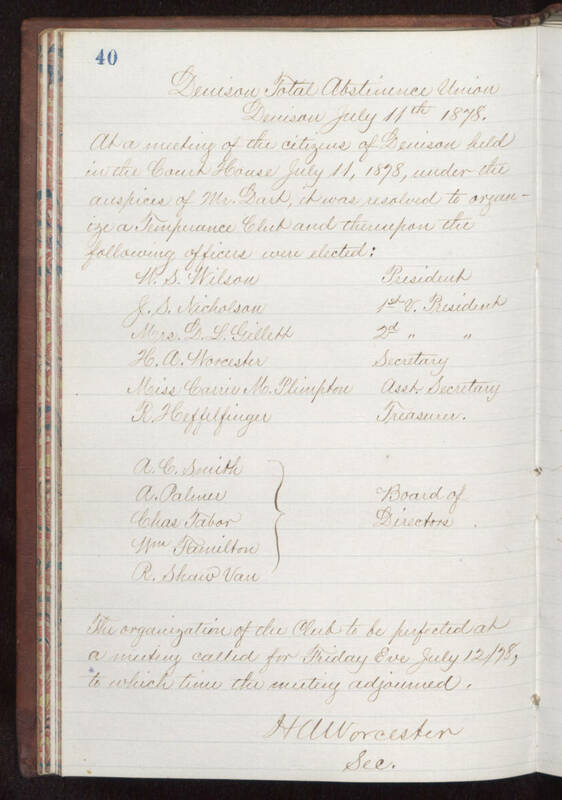 At a meeting of the citizens of Denison held in the Court House July 11, 1878, under the auspices of Mr. Dart, it was resolved to organize a Temperance Club and therefore the following offices were elected: W. S. Wilson President. J.D. Nicholson 1st V. President. Mrs. D.L. Gillett 2nd ". H. A. Worcester Secretary. Miss Carrie M. Plimpton Asst. Secretary. R. Heffelfinger Treasurer. A. C. Smith A. Palmer Chas Tabor [Mr?] Hamilton R. Shaw Van Board of Directors. The organization of the Club to be perfected at a meeting called for Friday Eve July 12/78 to which time the meeting adjourned. H. A. Worcester Sec.